Enter to WIN one of the Gifts For Men FREE giveaways and we'll ship you a cool product! To celebrate Gifts For Men's appearance on NBC's The Today Show and Spring right around the corner, we're giving away all of the products that were featured on the segment! 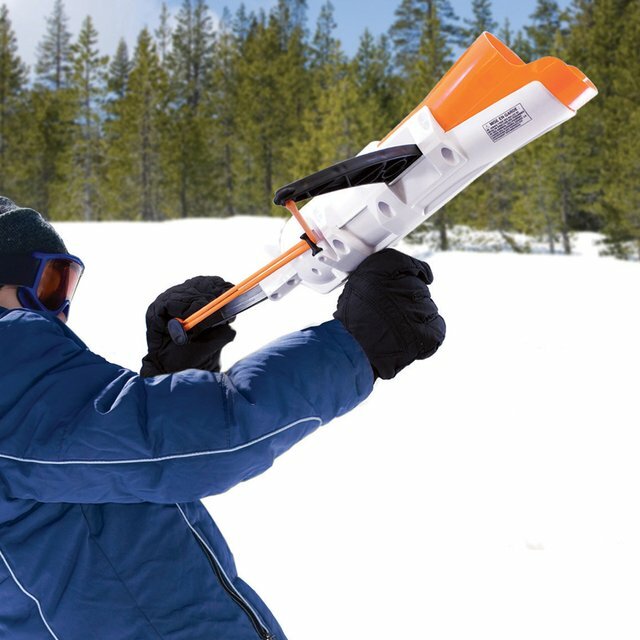 This week, we're giving away one Crossbow Snowball Launcher. To Enter: Simply LIKE our Facebook Page, and LIKE the contest post to be entered into the giveaway. The contest starts Sunday March 15, 2015 at 12 PM EST and ends Sunday March 22, 2015 at 12:00 AM EST. The winner will be chosen at random from all valid entries within 72 hours. Share with family and friends! 1. NO PURCHASE IS NECESSARY TO ENTER OR WIN. PURCHASE WILL NOT INCREASE YOUR CHANCE OF WINNING. 2. Eligibility: Gifts For Men Like To Win Sweepstakes (“Sweepstakes”) is open to persons who are legal residents of, and physically located within, the 50 United States or D.C., age 18 or older at time of entry. Void where prohibited. All federal, state and local laws and regulations apply. Employees of thegiftsformen.com and its affiliates, subsidiaries and advertising and promotional agencies, and the immediate family members (herein, defined as spouse, siblings, children and each of their respective spouses, regardless of residence and any person living in such a person’s household, whether related or not) of each, as well as the employees of any company affiliated with the Sweepstakes and collectively with the foregoing persons or entities, (the 'Sweepstakes Entities') are not eligible to participate. 3. This Sweepstakes is not sponsored, endorsed or administered by FACEBOOK, nor is FACEBOOK associated with the Sweepstakes in any way. Any questions, comments or complaints regarding the Sweepstakes must be directed to the Sponsor or Administrator, and not to FACEBOOK. 4. Entry Periods: Sweepstakes starts at 12:00 PM Eastern Time (“ET”) on March 15, 2015 and ends at 12:00 AM ET on March 22, 2015 (“Sweepstakes Entry Period”). 5. How To Enter: During the Sweepstakes Entry Period, visit https://www.facebook.com/thegiftsformen (“Website”), find the “Like/Comment To Win” posts posted by Gifts For Men March 15 - March 22, 2015 (“Post”) and like the post using the Facebook functionality on the Page (“Like/Comment”). Limit: one (1) Entry per Facebook account during the Sweepstakes Entry Period. Sharing the post on your own timeline or another person or page's timeline does not constitue an entry. a. Content and Originality: Each Entry must be the original work of the Entrant, may not have been previously published and may not have won previous awards. b. No Names and Likeness Without Permission: The Entry must not use individuals’ names, in whole or in part (except for the Entrant’s first name); refer to public figures; contain materials embodying the names, likenesses, or other identifying elements of any person, living, or dead without permission. c. No Illegal, Offensive or Inappropriate Content: The Entry must not, in the sole and unfettered judgment of the Sponsor, contain words, images or statements considered offensive to individuals of any race, ethnicity, religion, sexual orientation, or socioeconomic group nor contain material that is unlawful, sexually explicit, libelous or content that potentially infringes on their party rights. Content must be in keeping with Sponsor’s reputation and image, at Sponsor’s sole discretion. Any failure to meet the above Requirements and Clearances may result in disqualification. 8. Entries using macro, robotic, script, or other forms of automatic entry will be disqualified. Entries become the property of the Sponsor and will not be returned. Proof of submission does not constitute proof of receipt. If there is a dispute as to the identity of Entrant, the prize will be awarded to the authorized Facebook account holder associated with the winning Entry. The 'authorized account holders' is defined as the natural person to whom the Facebook account is assigned by Facebook. If a dispute cannot be resolved to Sponsor's satisfaction, the affected entry will be deemed ineligible. 9. Prize and its Approximate Retail Value (“ARV”): One (1) Prizes: A Crossbow Snowball Launcher from Gifts For Men (Valued at $25). One (1) sum awarded to the entrant at time of winning. Odds of winning depend on the number of eligible entries received. Prizes pictured in advertising, marketing or promotional materials are for illustrative purposes only. In the event there is a discrepancy or inconsistency between statements contained in any such materials and the terms and conditions of these Official Rules, these Official Rules shall prevail, govern and control. Any applicable taxes and all other costs/expenses not specifically identified in these Official Rules are the sole responsibility of each Winner. The Sweepstakes Entities are not responsible for any cancellations, delays, diversions or substitutions, or any act or omission whatsoever with respect to the Prize. Prize is nontransferable and no substitutions or cash redemptions will be made, other than as provided herein. Sponsor reserves the right to substitute the Prize of equal or greater monetary value if the Prize cannot be awarded as described for any reason. 10. Random Drawing and Notification: One (1) potential winner (“Potential Winner”) will be selected from the collective entries received during the Sweepstakes Entry period via a random drawing conducted by the Sponsor on or about March 15, 2015. The Potential Winner need not be present to win, and will be contacted by the Sponsor via a Facebook comment or message on or about three (3) business days after the Drawing to obtain additional information needed to verify the eligibility of the Potential Winner and send him/her their prize after she/he is confirmed. The potential winner will have seventy-two (72) hours from the time Sponsor sends notification to accept and complete the official winner notification email requests before receipt of the Prize. If potential winner does not claim prize by responding to notification within seventy-two (72) or if potential winner is deemed ineligible, potential winner forfeits prize. Potential Winner may be required to sign an affidavit of eligibility and a liability and publicity release (“Affidavit”) at Sponsor discretion before she/he is confirmed as a Winner. Should this be the case, the Potential Winner must return the completed Affidavit within five (5) business days from the date of notification or prize will be forfeited and awarded to an alternate winner selected at random. Once the Potential Winner’s eligibility is verified, s/he will be confirmed as a winner (“Winner”). 12. General: By entering this Sweepstakes, Entrants agree to by bound by these Official Rules and the decisions of Sponsor on all matters relating to the Sweepstakes, which are final and binding. The Winner is solely responsible for all local, state and federal taxes on the prize including sales or use taxes, as well as any expenses related to participation in the Sweepstakes or acceptance of his/her Prize. By participating, each Entrant agrees to, releases and holds the Sweepstakes Entities and their respective divisions, affiliates, subsidiaries, officers, directors, employees, agents, and representatives (collectively “Releases”) harmless from any injury, loss, or damage to person, including death, personal injury or loss or damage to property due in-whole or in-part, directly or indirectly to the acceptance or use/misuse of the Prize, participation in any promotion-related activity, or participation in the Sweepstakes. Entrants also accept and agree to be bound by the Official Rules and decisions of the Sponsor and Administrator, which are final and binding. This Sweepstakes is subject to all federal, state and local laws and is void where prohibited. By accepting the Prize, Winner agrees, where imposing such condition is legal, that Sponsor and their designees shall have the right, but not the obligation, to use of his/her name, city and state of residence and/or likeness for advertising and publicity purposes in any and all media now or hereafter known throughout the world in perpetuity without further compensation, permission or notification and, upon request, will confirm consent to such use in writing. Sponsor is not responsible for any typographical or other error in the offer or administration of this Sweepstakes, or in the announcement of Winner and Prize. In the event Sponsor is prevented from continuing with this Sweepstakes, or the integrity and/or feasibility of the Sweepstakes as planned is undermined by any event including but not limited to fire, flood, epidemic, earthquake, explosion, labor dispute or strike, act of God or public enemy, satellite or equipment failure, riot or civil disturbance, war (declared or undeclared), terrorist threat or activity, or any federal, state, or local government law, order, or regulation, order of any court or jurisdiction (each a “Force Majeure” event or occurrence), Sponsor shall have the right, in its sole discretion, to abbreviate, modify, suspend, cancel, or terminate the sweepstakes and award the Prize from among all eligible Entries received up to that date. In the event of any changes to the Facebook invitation system made by Facebook during the Sweepstakes Entry Period that restrict the awarding of Additional Entries, that portion of the Additional Entries will be discontinued. All disputes, claims and causes of action at law or in equity (individually, 'Claim&') arising out of or relating to this Sweepstakes, the meaning or interpretation of the rules or the Prize awarded shall be resolved by applying the laws of the Commonwealth of Pennsylvania, without regard to conflict of laws provisions therein, and shall be solely and exclusively brought in the state or federal courts within the Commonwealth of Pennsylvania. All Claims shall be resolved individually, without resort to any form of class action and all Claims, judgments and awards shall be limited to actual out-of-pocket costs incurred, but in no event include attorneys' fees, and under no circumstances will any entrant be permitted to obtain awards for, and hereby waives all rights to claim, punitive, incidental, special, consequential damages and any other damages, other than for actual out-of-pocket expenses and waives all rights to have damages multiplied or otherwise increased. 13. Sponsor: Gifts For Men (“Sponsor”), whose decisions are final and binding as to all aspects of this sweepstakes. 14. Winner's List: For the name of the winner, send an email to info@thegiftsformen.com on or before March 29, 2015. 15. Opt-Out: If you wish to Like the post but do not want to enter the Sweepstakes, please send your name as it appears on your Facebook Account via e-mail to info@thegiftsformen.com with the subject line “Sweepstakes Entry Opt-out” by March 22, 2015. Gifts For Men complies will all Facebook Promotional Guidelines. For details on Facebook's promotional policies visit https://www.facebook.com/page_guidelines.php. To celebrate Gifts For Men's appearance on NBC's The Today Show, we're giving away all of the products that were featured on the segment! 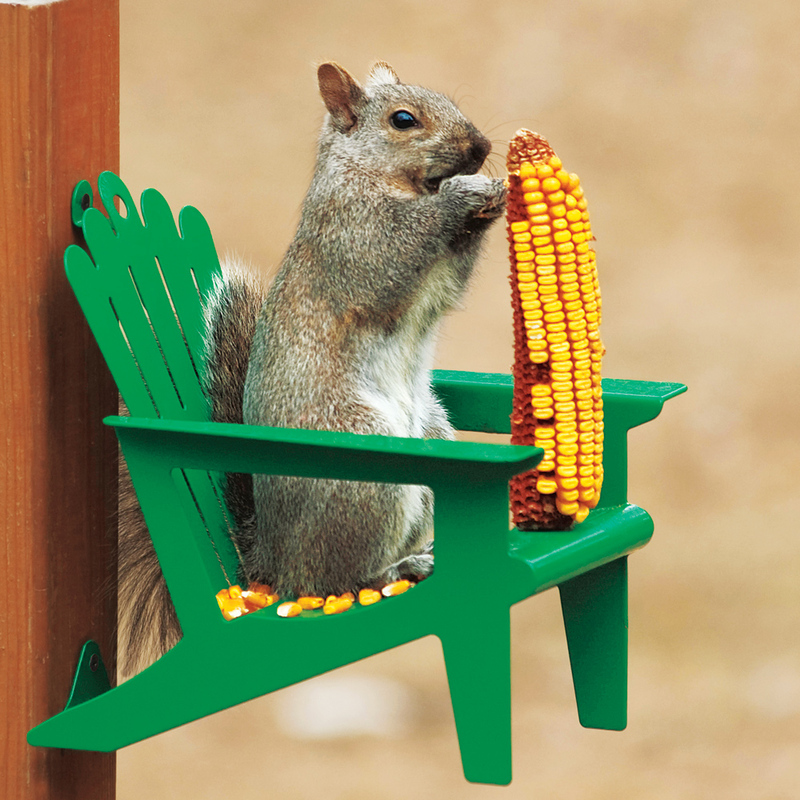 Last week, we gave away one Adirondack Chair Squirrel Feeder. The contest started Sunday March 1, 2015 at 12 PM EST and ended Sunday March 8, 2015 at 12:00 AM EST. Congrats to our lucky winner Joe F. from Cockeysville, MD who was selected at random from all valid entries. Congrats Joe! 4. Entry Periods: Sweepstakes starts at 12:00 PM Eastern Time (“ET”) on March 1, 2015 and ends at 12:00 AM ET on March 8, 2015 (“Sweepstakes Entry Period”). 5. How To Enter: During the Sweepstakes Entry Period, visit https://www.facebook.com/thegiftsformen (“Website”), find the “Like/Comment To Win” posts posted by Gifts For Men March 1 - March 7, 2015 (“Post”) and like or comment on the post using the Facebook functionality on the Page (“Like/Comment”). Limit: one (1) Entry per Facebook account during the Sweepstakes Entry Period. Sharing the post on your own timeline or another person or page's timeline does not constitue an entry. 9. Prize and its Approximate Retail Value (“ARV”): One (1) Prizes: A Adirondack Squirrel Chair Feeder from Gifts For Men (Valued at $25). One (1) sum awarded to the entrant at time of winning. Odds of winning depend on the number of eligible entries received. Prizes pictured in advertising, marketing or promotional materials are for illustrative purposes only. In the event there is a discrepancy or inconsistency between statements contained in any such materials and the terms and conditions of these Official Rules, these Official Rules shall prevail, govern and control. Any applicable taxes and all other costs/expenses not specifically identified in these Official Rules are the sole responsibility of each Winner. 10. Random Drawing and Notification: One (1) potential winner (“Potential Winner”) will be selected from the collective entries received during the Sweepstakes Entry period via a random drawing conducted by the Sponsor on or about March 8, 2015. The Potential Winner need not be present to win, and will be contacted by the Sponsor via a Facebook comment or message on or about three (3) business days after the Drawing to obtain additional information needed to verify the eligibility of the Potential Winner and send him/her their prize after she/he is confirmed. The potential winner will have seventy-two (72) hours from the time Sponsor sends notification to accept and complete the official winner notification email requests before receipt of the Prize. If potential winner does not claim prize by responding to notification within seventy-two (72) or if potential winner is deemed ineligible, potential winner forfeits prize. 14. Winner's List: For the name of the winner, send an email to info@thegiftsformen.com on or before March 21, 2015. 15. Opt-Out: If you wish to Like the post, or Comment on the post but do not want to enter the Sweepstakes, please send your name as it appears on your Facebook Account via e-mail to info@thegiftsformen.com with the subject line “Sweepstakes Entry Opt-out” by March 8, 2015.